HVAC and plumbing design for a computer control room, motor control center, rack room, and locker room. Vapor absorbers were used to filter the air and maintain positive air pressure in the electrical rooms. Designed the HVAC and plumbing for the 400 SF production facility lab used to evaluate the mixture of chemicals used to make paper. The lab was sealed and maintained at positive pressure, and air was filtered through charcoal filters prior to entering the space. 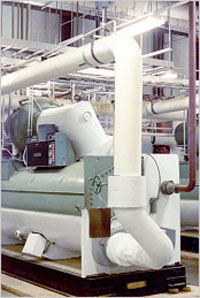 Provided HVAC/Piping coordination design for machine floor heating and ventilation system. System utilized eight air makeup units with steam heat, totaling 850,000 CFM of outside air. Also provided HVAC design for a TAPPI lab for paper testing, and design hoods and an exhaust system for pulper hoods. HVAC upgrade of an 80,000 SF manufacturing facility. Project included new equipment and electrical rooms, a 60 BHP low pressure steam boiler, two 200 ton water cooled screw chillers, cooling towers, constant speed primary chilled water pumps and variable speed secondary pumps, four 30,000 CFM custom fabricated air handlers, one 200 HP air compressor and two 20 HP vacuum pumps for process utilities, ductwork and utility piping, and electrical gear. The project included a new cafeteria and offices renovations. Performed an energy study on an 80,000 SF manufacturing facility. Analysis was performed utilizing Carrier HAP program. Energy calculations compared previously installed heat pumps with newly installed chilled water system. Project won local and regional ASHRAE awards. Design of a 2,500 sq. ft. mechanical room for Plant #1. 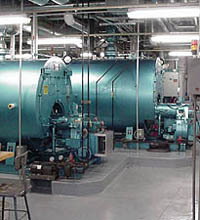 Project included a 200 and 300 ton water cooled chiller with further expansion for a additional 150 ton chiller, a 400 hp water cooled centrifugal air compressor, two (2) 100 hp air cooled screw air compressors, a thermal mass air dryer, primary and secondary pumps, cooling towers, and associated electrical gear. Performed a hydraulic analysis of the chilled water loop for Plant #1. Upgraded an existing low pressure steam system. Project included two (2) boilers (100 BHP & 200 BHP), feedwater system, domestic water heater, relocation of steam pressure reducing station, and associated controls. Designed utility piping, P&ID’s, and equipment arrangements. Piping layouts included resins, chilled water, compressed air, natural gas and hot water. Designed exhaust ducting for two 16,000 CFM thermal oxidizer. Provided an analysis of the existing 100‑foot stack for additional thermal equipment tie‑in and draft balance. Provided design work for the installation of two 200 HP air‑cooled air compressors. Provided engineering design study on a process dying operation to determine waste stream flow. Engineering design study included preliminary sketches and cost estimate for a 400,000 gallon lined equalization pond. Provided engineering design and construction administration services for a 800 foot, 24” diameter waste stream line from a pump house to an equalization pond. Provided mechanical engineering services for a 400,000 gallon equalization basin. Designed piping layout, P&ID, and controls. Steam condensate piping design for waste heat recovery boiler. Developed P&ID’s and designed utility piping for (6)-70,000 CFM wet electrostatic precipitators. Stockhausen, Inc., Greensboro, NC. Provide ventilation design for two (2) process buildings. Buildings included approximately 300 motors, platebelt dryers and exhaust ducts, scrubber vessels, and various other pieces of equipment. Provided onsite support for documenting the mill’s duct collection system from points of pickup to their respective baghouse. Provided design for a fuel oil piping system for the mill’s emergency generator. System included a day tank, 1,000 ft. of supply and return piping, two pump stations, controls, and electrical power for the pumps. Provided design for a 385,000 CFM ventilation system for 110,000 SF finishing area in an OSB Mill. Design included a large canopy hood over the strapper platform with a variable speed fan. Hydraulic piping for installation of a long log flaker system. Project included locating and piping several hydraulic units, redesign of the fire protection and fire alarm systems.